Our wireless controller belies its power. Buttons on the intuitive remote are grouped in a logical layout. Common sizes can be directly accessed. And the buttons are luminescent! Commands from the remote are broadcast in a wide pattern. Matching receiver can be easily positioned for best reception. For rooms with long refraction distances, the Desktop Readout provides optimal feedback. For charts with many lines, one button press on the Direct-Access Remote, displays the next group of lines. This Readout may also be configured for wall or instrument stand mount. StimuliTM eliminates the "Memory Effect" through computer generated random characters. StimuliTM supports more tests and can provide patient education and entertainment. Doctors find the speed and feature set of StimuliTM systems a real aid to their busy practice. Technicians appreciate the ease of use. 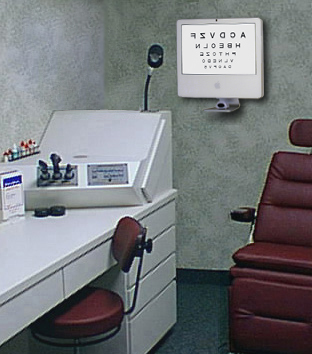 Patients are pleased by the modern appearance and believe StimuliTM vision tests are more accurate. There are fewer distractions for the patient because all tests and media are consolidated onto a single screen. 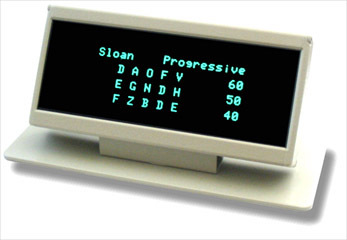 Optotypes include: Snellen, Peds, E´s, Numerals and more. StimuliTM can be calibrated for short, long or mirrored rooms. "It's fast and easy and the kids just love the cartoons." "At first I was skeptical, but after one day I was Sold!" 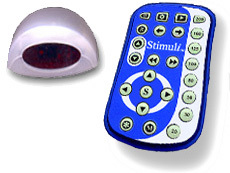 "StimuliTM is a product that both staff and patients love." "Has great application for Low Vision and Peds." StimuliTM installed in a folded room. Foot Pedals are available as an option allowing control of common functions in each testing suite, thus leaving the hands free. StimuliTM Desktop: The All-in-one Desktop System. StimuliTM Dual Desktop: With extra doctor monitor. StimuliTM Transportable: Portable Laptop System. PORTALTM-Ready StimuliTM: Can be upgraded to PORTALTM.